When Claire was preschool age, we frequented a wonderful Mexican restaurant in the neighborhood, El Mirador, with very authentic and delicious Mexican cuisine. Claire, the ever-picky eater, was happy ordering rice with cheese and the refried beans. Since the combination of the rice and beans is a complementary protein mix that offers all amino acids, it was a plus in my mind as she mostly ate cereal and pasta with butter! 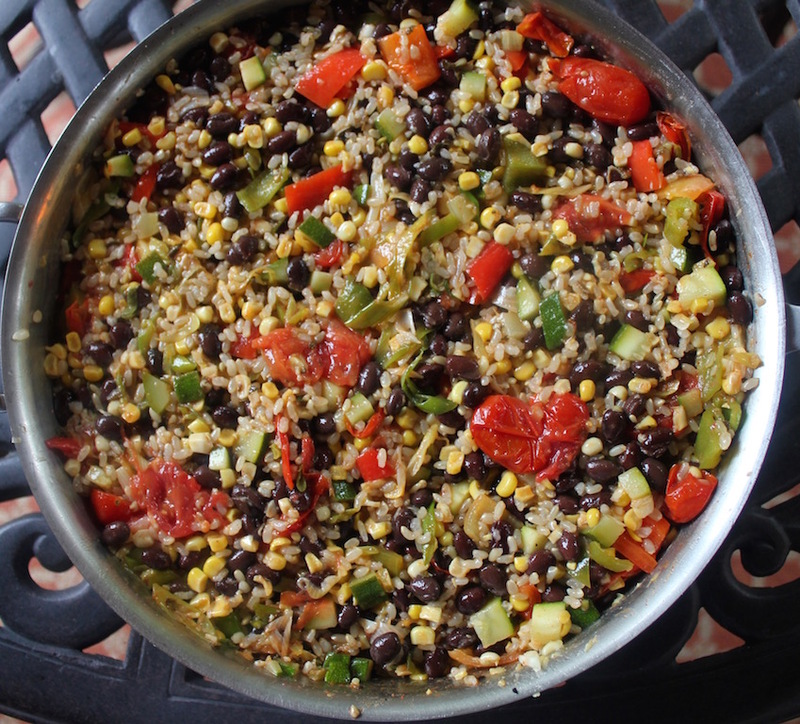 This recipe for Black Bean Rice and Vegetable Casserole is sure to please her more sophisticated palette today. 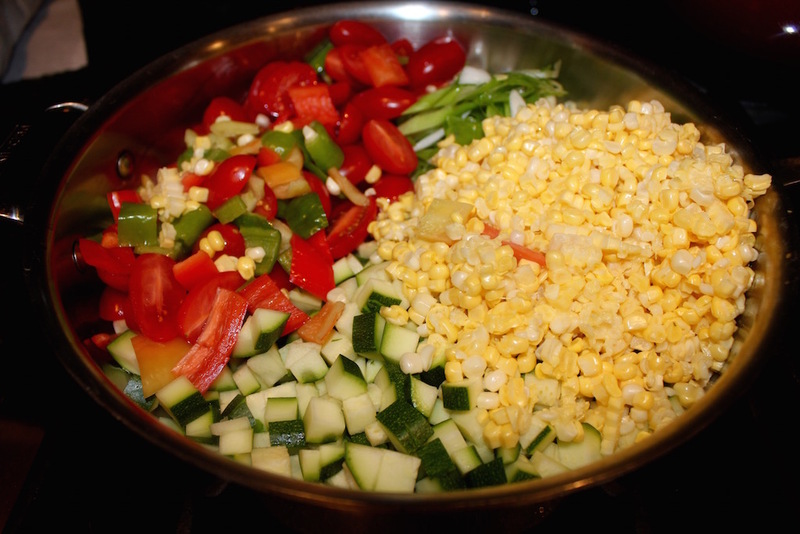 This is a simple recipe and it’s filled with fresh vegetables: scallions, tomatoes, zucchini, corn and frying peppers. 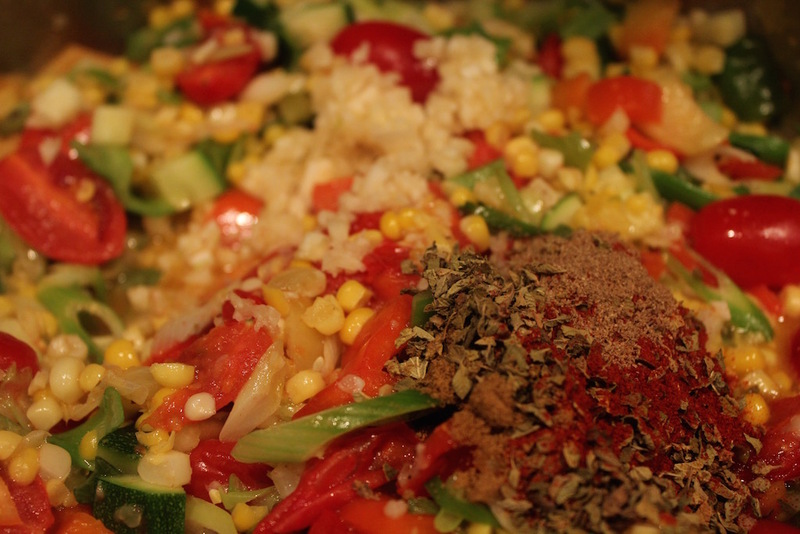 I chose to use oregano and Spanish smoked paprika as the primary spices. Include this in your meatless Monday repertoire if you have one, or start a new weekly trend! A wide skillet (12- by 2 inches) is the perfect size and can go from stovetop to table, saving you an extra dish to wash. The first thing to do is set up your rice, which can cook while you prep the other ingredients. I use this easy pasta method to cook the rice, a short-grain sweet brown rice. Heat the oil in the skillet over medium heat and toss in the tomatoes, corn, zucchini, scallions, peppers, salt and pepper, stir to combine, cover and let cook for five minutes. Stir in the garlic, oregano, paprika, coriander and cumin for 30 seconds. Fold in the beans and rice and cook until the beans are heated through, about two minutes. Top with cheese and slip under the broiler on a low shelf until melted, about one or two minutes. Garnish with pickled jalapeno peppers. This recipe can be made a day ahead omitting the cheese. Cool the skillet, cover and refrigerate overnight. Preheat the oven to 350 degrees F, cover with the shredded cheese and bake for 30 minutes. Garnish with the pickled jalapenos and serve. Use any leftovers for black bean tacos! The recipe works well without the cheese for a vegan entreé. 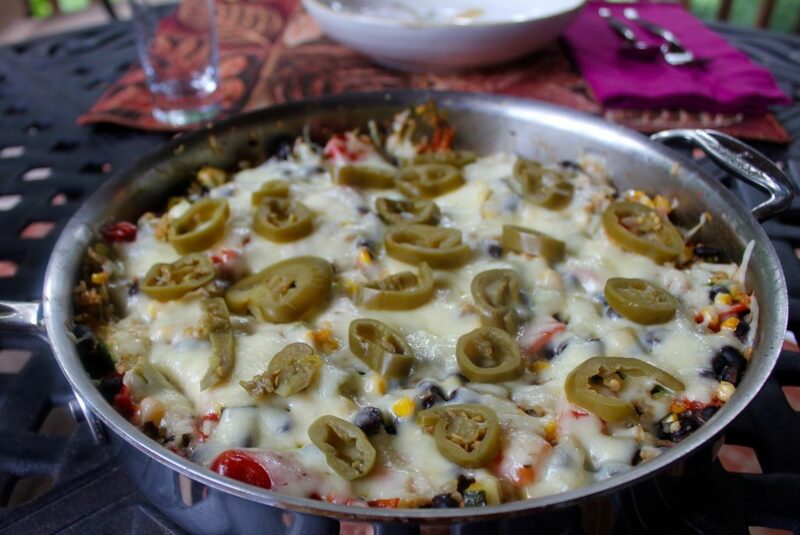 Black Beans Rice and Vegetables is a vegetarian entreé topped with shredded Monterrey Jack cheese and pickled jalapeños. Omit the cheese for a vegan entreé. Garnish with the pickled jalapenos and serve. Bring the water and salt to a boil. Stir in the rice, return to the a gentle boil and cook according to the suggested timing on the package . Fold in the beans and rice and cook until the beans are heated through, about two minutes. Top with cheese and slip under the broiler on a low shelf until melted, about one or two minutes. Garnish with pickled jalapeno peppers. Use any leftovers for black bean tacos!